Primacy is a high-end printer that is easy-to-use, flexible and fast. When loaded with the Evolis cutting-edge encoding technologies, Primacy turns into the ideal solution to issue cards. Primacy is available in single or double-side printing versions, with or without encoding technologies. The encoding or double-sided printing options can be installed to order or at any time after on site. All Primacy versions are available with USB and Ethernet TCP/IP connectivity. Primacy personalises colour cards in a record time. Up to 210 cards per hour for one side, and 140 cards per hour for dual-sided printing. The same machine can print on either one or both sides, and the dual-sided option can also be activated on-site. This flexible printer can also be fitted with additional options at any time, when magnetic and contact/contactless encoding are required. Primacy card printer comes with a very convenient 100-card feeder. Shipped with the Evolis Premium Suite® software solution, Primacy makes self-adjustments when in operation. Users benefit from screen-based alert pop-ups, while 24/7 online help is available just a click away. Cards can be simply loaded at the printer's front side. Ribbons are available in a cassette system that can easily be dropped into the printer. Each ribbon is automatically set and identified. This allows you to create personalised plastic ID membership and loyalty cards. 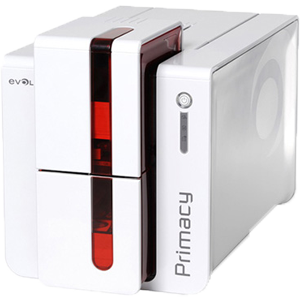 Whether you need to print mono colour or full colour cards, the Evolis Primacy ID card printer is the answer. This desktop solution is ideal for creating identification, loyalty or membership card schemes, the ideal 'click & print' solution delivering your cards in seconds! Using a suitable application of your own, generate your ID cards at a click of a button. Need help choosing? Please call our sales team on 02 9651 6000 or use our enquiry form. Disclaimer: Products may vary from shown images.